The faculty, staff, and students of the Asian Canadian and Asian Migration Studies Program are deeply saddened by the recent passing of Bill Wong on April 8, 2017. Bill was a beloved member of the local Chinese Canadian community. His father was a head tax payer who opened a tailor shop, Modernize Tailors, in Chinatown. Born in Vancouver, Bill obtained an engineering degree from UBC but was unable to practice due to the pervasive racism against Chinese in Canada at the time. 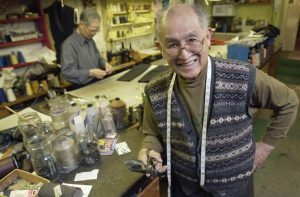 In the 1950s, he inherited his father’s shop and became one of the most respected tailors in the Vancouver. Modernize Tailors celebrated its 100th anniversary in 2013. In 2014, his diaries from a year spent in China as a teenager were translated and published as A Year in China: Bill Wong’s Diaries in His Father’s Home Village 1936-37. Bill was widely known for his generosity and inspired many with his life story; he was an early supporter of ACAM and could be seen regularly at our events. ACAM would like to extend our sincere condolences to Bill’s family and friends. He is deeply missed.